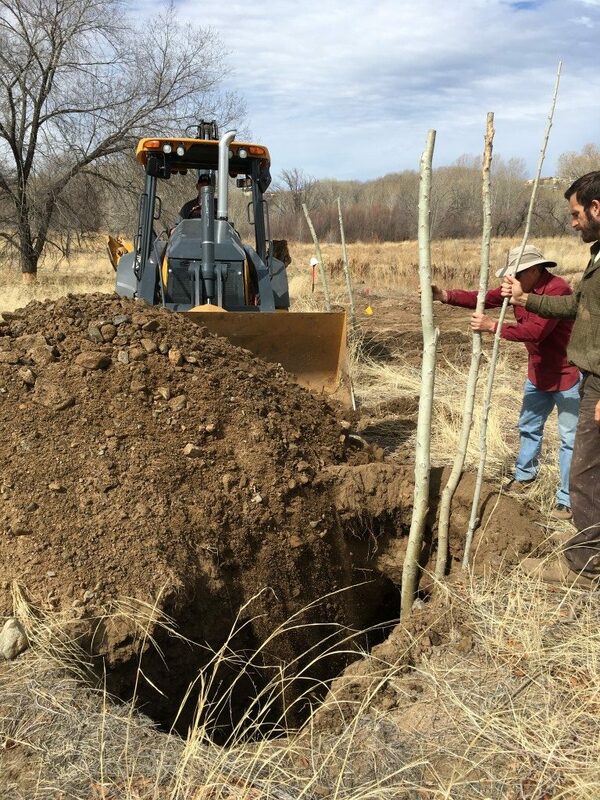 During this past winter, Prescott Creeks took the opportunity provided by the dormancy of Cottonwood trees and Willow shrubs to harvest pole cuttings for revegetation in the Preserve. Cottonwoods and Willows are members of the Willow Family, (Salicaceae) of which all members have an amazing ability to reproduce asexually. In the wild they grow along waterways, where are subjected to periodic floods. The force of flooding can break off branches, which can get washed downstream and buried in the sand. With continued access to water, these branches will sprout roots and grow into full-size trees and shrubs. We humans can take advantage of this natural ability to clone Willow Family plants with relatively little effort and no high-tech equipment. All that is needed to clone Cottonwoods and Willows are cuttings of healthy branches, which can be soaked in the creek and then planted. From late December to early February, Prescott Creeks harvested over 500 cuttings. This could not have been achieved without the many hours of assistance provided by Yavapai County Adult Probation Restitution Work Crews and several community volunteers. In late March, every single one of these pole cuttings was planted. Cottonwoods and Willows are known as phreatophytes, which means they must be planted deep enough that they are in contact with groundwater. As it turns out, Prescott Creeks has several groundwater monitoring wells within Watson Woods that told us we needed to go at least 9 feet deep to hit water. Achieving this depth required the use of a backhoe and an experienced operator to dig deep pits without causing unnecessary disturbance. Sincere thanks go to Mike Young and Bill Sullivan from Fann Environmental, and to our outstanding volunteer Dave Frechette for helping us plant this riparian vegetation. Planting pits ranged in depth from 6 feet deep in low-lying areas to over 12 feet deep at the higher elevation locations. Project background: When the City of Prescott installed their sewer line installation from the Sundog Wastewater Treatment Plant to Highway 89 last summer, they asked Prescott Creeks to mitigate the impact of the project within Watson Woods Riparian Preserve. During the planning phase of this project, the city had abandoned their original plan to open-trench across Granite Creek in favor of a less disruptive option: using a horizontal directional drill to tunnel under the Preserve. While disturbance was decreased by drilling, some disturbance was unavoidable on each end of the tunnel. Drilling was initiated within Watson Woods, just south of the Prescott Lakes Parkway bridge. This area was home to scrubby vegetation and just a couple of trees. In addition to the drill entry location, there were significant impacts where the drill exited the ground south of the intersection at 89 and Prescott Lakes Parkway, a steep slope that consisted almost exclusively of the native shrub Apache Plume. With the help of volunteers from the Prescott Valley Stake of the Church of Latter Day Saints, BASIS School, Prescott College, Embry Riddle Air Force ROTC, and our very own Prescott Creeks C.R.E.W., 600 Apache Plume shrubs were planted on this slope. These plants will help to stabilize the slope while providing habitat for nesting birds and food for pollinators. At the same time, the Apache Plume’s annual display of summer flowers, followed by showy plumes of pink seeds in the fall will help beautify your drive while heading north on Highway 89. Next time you are in Watson Woods, stop by the planting site near the bridge and take a look at our future forest! See new growth or anything else interesting? Report it to Field@PrescottCreeks.org – we would love to hear from you. If you are interested in helping out with similar projects, you can sign up to volunteer at www.PrescottCreeks.org/volunteer.